The I-Corps program offers many potential benefits to participants. Here is a short list derived from the experience of past participants. 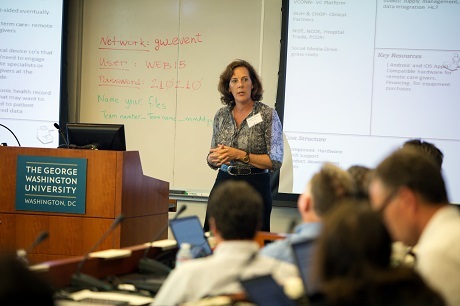 Introduction to the programs and team at GW’s Office of Innovation and Entrepreneurship. Grants of up to $3,000 to assist with customer discovery. Establish a path to NSF’s national I-Corps program with grants of $50,000 for I-Corps, and subsequent opportunities for the PFI-AIR prototyping grant and SBIR ($200,000). Improves quality of university research. Greater understanding of your technology/innovation and how it can benefit society. Knowledge about how to commercialize technology and the barriers to adoption. New market opportunities that you had not previously considered. New skills and toolset that you can use to test innovative ideas, make your research more commercially relevant, and assess potential new ventures. Greater self-confidence, and better presentation/interpersonal skills, in typical business settings. Savings in time and money through accelerated understanding about the real value of your innovation – from the market perspective. Expanded network through priceless interaction with teachers, investors, customers, and mentors. Satisfaction in building an innovation ecosystem that will significantly benefit the DC and greater mid-Atlantic region. I-Corps was a great experience. It knocked us out of our comfort zones and taught us a lot. If I’d had this information twenty years ago, I’d really have been dangerous!